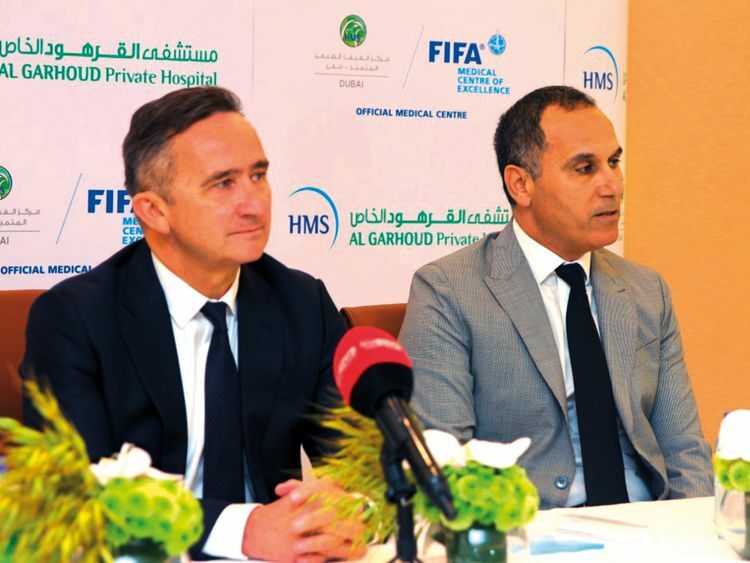 Dubai: The Fifa Medical Centre of Excellence at the Al Garhoud Private Hospital, Dubai is confident of attracting many more international sportspersons with the addition of Dr Philippe Landreau to the team. The surgeon, who is also vice-president of the International Society of Sports Surgeons (ISSS), Landreau used to be the head of surgery at the Private Hospital of Sport Medicine, Paris, the American Hospital of Paris and the University Hospital of La Pitie-Salpetriere, Paris. “Dr Landreau is a highly accomplished orthopaedic surgeon specialised in sports traumatology, knee and shoulder surgery and arthroscopic surgery, and his inclusion on our specialised team will ensure the second strategic phase for us at the centre,” Dr Mourad Ghairi, Chief Medical Officer, Fifa Medical Centre of Excellence, told Gulf News. Since its opening in 2016, the Fifa Medical Centre of Excellence has been at the forefront of sports specialisation with more than 50,000 physiotherapy sessions, 10,000 consultations, 250 athletic performance assessments and another 500 surgeries including those of famed sportspersons such as Didier Drogba, Harry Kane, Adam Lallana and UAE national team stars Omar and Mohammad Abdul Rahman. “What we have achieved in the past three years has pushed us into taking the next step in our strategy of providing the best health care for sportspersons from the UAE and other parts of the world,” Dr Ghairi said. “We have reached our goal and quality of international players who have come and got their treatment with us. Because of this we have jumped into the second phase wherein the centre at Al Garhoud Private Hospital becomes a dedicated destination for the excellence of surgeries dedicated to sports injuries,” he added. “The strategy now is to attract high-level and well-known trained experts from around the world and we have made a start with Dr Landreau. In the next three years we will target more people from outside to get their treatment done here to achieve the vision of the Government in making Dubai the destination for health tourism,” he insisted.